The last couple of hours has seen the market slowdown and many coins turn red following the early weekend pump. Despite the slowdown, major coins such as Bitcoin, Ethereum, and XRP continue to trade well above their recent established resistance levels. At the time of press, Bitcoin is sitting well above $3,600, ETH is trading slightly above $117 and XRP is clinging above $0.30. As for the total market, the rally has seen the total market cap climb above $120 billion. Although it is not certain what triggered the pump, a statement from an SEC official that a Bitcoin ETF was inevitable, could have played a great role, giving the desired boost to see a market rally. Among the coins marking a slowdown and possibly one of the highest price correction is Tron [TRX]. At the time of press, Tron is recording a drop of over 5%, the highest in the top 20 cryptocurrencies. Although the coin was not recording as high gains as other coins in the top level, the drop has been far worse than all of them. The lack of a high price surge and the drop, come as a surprise given the coins recent performance, which has been recommendable. 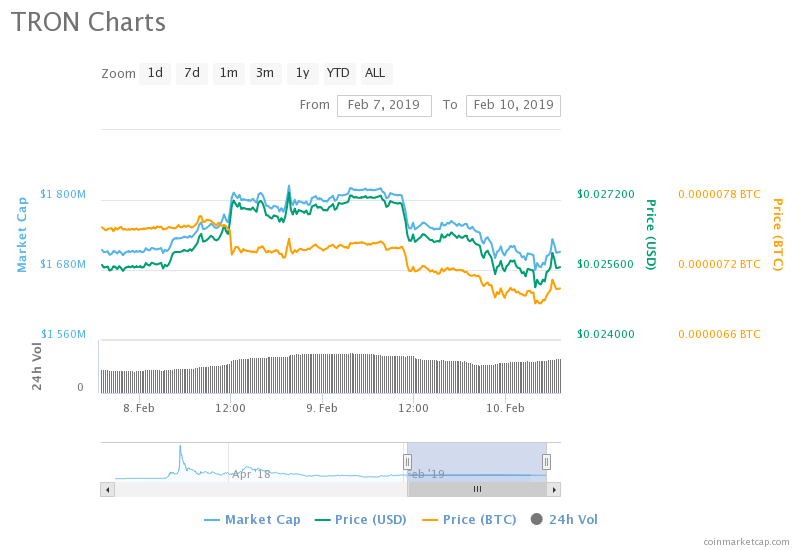 Despite a rocky couple of weeks for the market, Tron has kept prices stable and at times surging in a bearish wider market. Now, with the market cap difference between Tron and Stellar being under $200 million, extended losses from Tron could see it slip behind Stellar in ranking. However, given how fast Tron has been responding to positive developments around the project and how keen the project has been with developments, it is unlikely that when and if Tron goes down, it will stay down. The last couple of days have been a major boost to the crypto community. Not only is there a revived optimism following the market rally, but there’s also revived optimism in the SEC approving the first Bitcoin ETF. As Bitcoin continues to trade above $3,500 and by extension $3,600, there’s real optimism that with more bullish pressure, the market can rally and establish new highs. The next key level for the bulls will be $4,000, a position that will be more convincing for investors that the bearish trend is ending. In the next couple of hours, Bitcoin will be looking for support, one that must be above $3,600 if the bullish sentiments are to persist in the coming days. Next articleEthereum Price: Consolidating For The Next Leg Up?